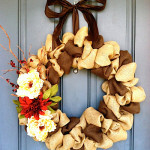 A mesh ribbon wreath is perfect for this time of year. The holiday season is around the corner. It’s a time to swap ideas on where to get the best deals on decorations. This season, why not do something different, something authentic, something that meets your personal tastes? You can save your money by making your own decorations. What’s more, it will be more fun when you do it with your friends and family. So, where do you start? The front door is a good place to show of your artistic side. 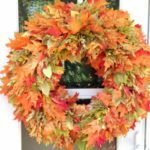 Here is how to make your own fall mesh ribbon wreath. 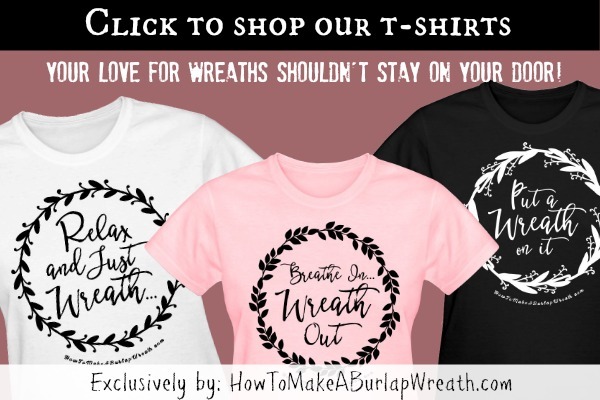 This season combine mesh and burlap ribbon for a unique look! 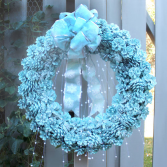 Lay the metal wreath frame on a flat surface. Start wrapping the pipe cleaners around it. Place the pipe cleaners at a space of 2 inches apart. Twist them cleaners around the wire starting from the frame’s center. Tighten to ensure that they do not fall off. Pinch together one ribbon end and attach to the frame using one pipe cleaner. Place the pinched end in between the pipe cleaners and twist around to hold it in place. A large wide mesh ribbon will work well. Arrange the mesh in a manner that partially conceals the pipe cleaner. The end of the pinched ribbon should rest on the wreath frame while the rest of the ribbon pops out over the knot of the pipe cleaner, and over the other end, covering the mesh end and the pipe cleaner. Take the ribbon (5-6 inches) and pinch the length. Attach the pinched portion to the next pipe cleaner’s center. Twist the pipe cleaner to hold the ribbon in place. You will see a bubble of ribbon form. Fluff the bubble until it is even. Repeat the same steps as above making several mesh bubbles. Continue pinching off 5-6 inches of the ribbon. 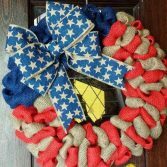 Attach each length onto the frame of the wreath. Be sure that you are using equal length of ribbon in every segment. 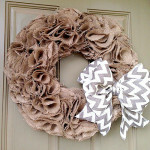 This will ensure that your wreath does not come out looking sloppy and uneven. 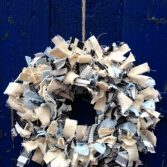 Once you have covered the entire wreath frame, cut off any remaining ribbon. Connect the end that you have cut to the beginning of the pipe cleaner. Curl the mesh ribbon end to retain its shape. This will also prevents any unsightly edges from being exposed. Add the ornaments to finish the wreath. 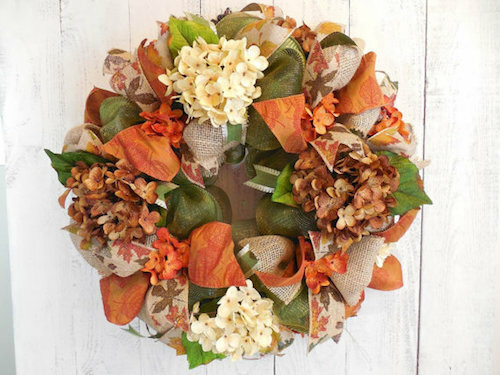 There you have it: a simple and beautiful fall mesh ribbon wreath. All that is left is for you to show it off on your front door, fireplace or walls. Don’t let your home look dull when you can spruce it up. 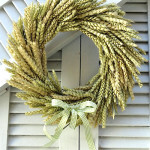 For more wreath ideas for your home, try this multi-colored burlap wreath tutorial. 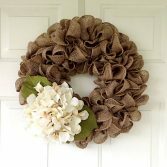 What a pretty wreath! 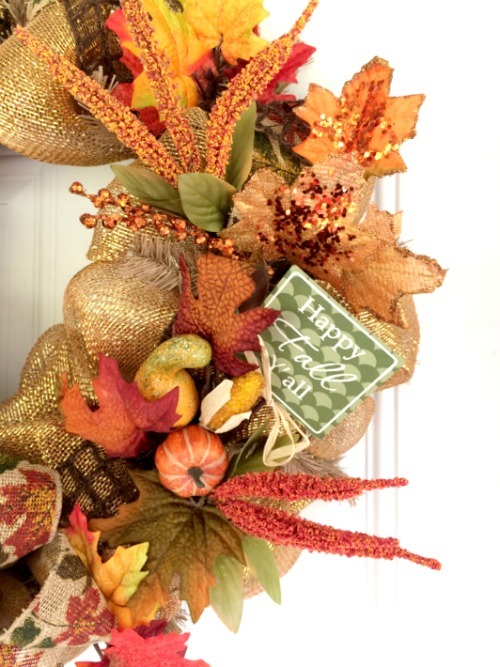 I love how you used the different textures and materials in this – perfect for fall. Happy Friday!